Our working approach is embedded in the philosophy of experiential learning as well as in the concepts of generative collaboration and collective intelligence. And since leadership development requires the development of emotional intelligence competencies, all of our services are developed and offered with the development of these skills as the bedrock. For us at Alievo, learning is a dynamic and continuous process of change rather than only the result of acquired knowledge. It is also a collective and reflexive process, which requires learning and understanding together. It is through this perspective that we think, develop and offer our services to our clients. Here is what guides our approach and how we orchestrate our services. At Alievo, emotional intelligence is the foundation on which we develop individual and collective leadership. We rely on the socio-emotional competency model of Dr. Reuven Bar-On, researcher, psychologist and professor. The model of Dr. Reuven Bar-On has been developed with high scientific standards and, even with its rigorous scientific foundations, it remains easy to understand and use within organizations and serves as a solid foundation for developing the competencies of our clients. 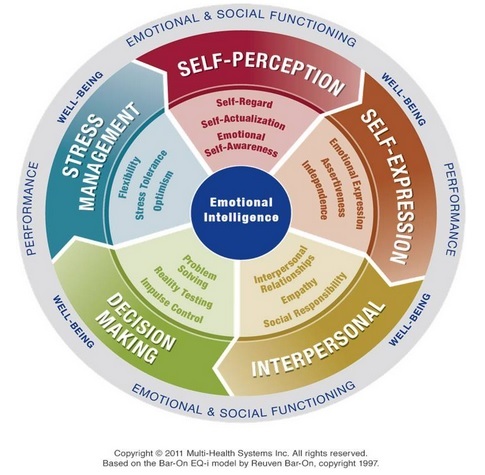 Just like cognitive intelligence (IQ), emotional intelligence (EI) can also be measured. It is called emotional quotient or EQ. Our assessment tools, the EQ-i 2.0®—Emotional Quotient and the EQ 360®—Emotional Quotient and 360° Feedback allow us to measure the EQ, offer our clients the opportunity to become aware of their current level of competency in EI and define a concrete action plan to develop their skills and their leadership. Our training courses are designed to help our clients become aware of their level of EI competency and to transfer their learning in order to exercise their leadership, to positively influence and guide their teams in times of transition and change. Our EQ Coaching is based on the model of Dr. Reuven Bar-On. We offer our clients the opportunity to become aware of their blind spots, strengths and areas for improvement in relation to their EI competencies, in order to establish with them an action plan which provides a direction to their coaching process and to their leadership development. Our Alievo Circles of AlliesTM, are offered under various specific themes aimed for the development of specific skills in emotional intelligence. At Alievo, we create learning experiences that are rich and grounded in our clients’ reality. To foster individual and collective leadership development, we focus on experiential learning. To take the lead and make decisions, to take action and to be accountable for results. The circular model below illustrates how we work. Learning, changing and self-improvement is done in a constant relationship with oneself, one’s environment and the people around us. The return on investment is exponential compared to a traditional learning program and the results are observable not only through improved knowledge and skills, but also through the emergence of new behaviours and new ways of doing things. Our training sessions are mainly intended for the creation of small groups to encourage exchanges, discussion and reflection. They combine theory and practice, reflection and action. Our Alievo Circles of AlliesTM are the very practice of the experiential learning model. Professional co-development, which is the foundation of Alievo Circles of AlliesTM, is a learning process in action. 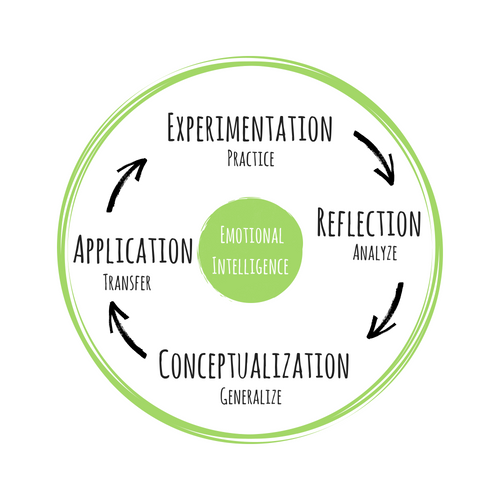 This approach aims to stimulate the process of reflection, develop the capacity to question, broaden and deepen learning and trigger rapid and effective action. As we are entering the 4th Industrial Revolution, the world is changing and evolving rapidly. In this context, it becomes essential to exert a leadership that unifies, inspires and brings people together. As a leader, it is important to know how to generate the right conditions for the emergence of positive and generative collaborations and make the most of collective intelligence. At Alievo, we team up with our clients and support them in developing their skills to achieve this. At Alievo, our corporate mission combines leadership development and creation of generative collaborations. Collaborating literally means “working with/together.” Although several teams and groups work together, not all are able to collaborate well. And fewer are those who can create what is called generative collaborations. When teams reach a level of collaboration that is described as generative, they produce a collective result that is significantly higher than the sum of the performances of individuals working alone. This is the outcome of an efficient and effervescent collective intelligence. This concept, defined by Robert Dilts, is an inspirational driving force at Alievo. Our assessment tools are simple and powerful. They can be used, among other things, to guide groups through organizational change processes, to develop the ability to positively influence a team or to foster the emergence of an organization’s collective emotional intelligence. Our training courses are designed and delivered to foster the emergence of the collective intelligence of our groups. We set up dynamic learning environments and rely on collaborative animations to create rich and unique experiences. Our EQ Coaching helps to see differently, to get out of the box and to create new ideas and new results. Our Alievo Circles of AlliesTM are incubators of collective intelligence! Together, throughout the sessions, and with experienced facilitators, the group moves from a basic collaboration to a generative collaboration that allows the emergence of ideas, solutions and amazing results.